Today is a very special day. What was to be a routine night yesterday turned out to be quite an event sometime close to midnight as GOD arrived silently onto Twitter. 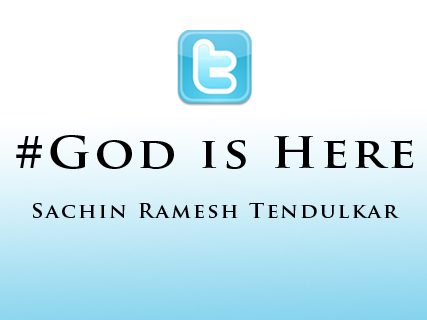 Yes, the only man that we call God - Sachin Ramesh Tendulkar has arrived on Twitter. He has only two words in his bio which read 'Proud Indian'. World watches in disbelief and it takes quite a few hours for the fact to sink in that it is the man himself who has arrived on Twitter and not some impostor. 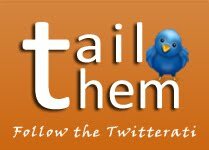 @TailThem kept a watch on the event as it unfolded, it was something akin to the birth of a baby. Following is an account of the first few hours of this event to be documented for posterity. Around 11.40 pm India time on 4th May 2010, ace photographer and celebrity management firm head Atul Kasbekar announced to the world the arrival of Sachin Tendulkar on twitter. This is what he tweeted. "Ladies n Gentlemen it is my proud privilege to introduce Finally to Twitter, SACHIN TENDULKAR, @sachin_rt, follow the King now, go go go !!!" Immediately Sachin tweets the following. His first tweet. "Finally the original SRT is on twitter n the first thing I'd like to do is wish my colleagues the best in the windies,"
Most people who get wind of this id think its a fake, no one is sure if its the real man. 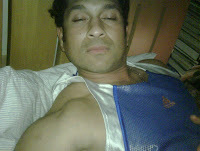 Then Sachin goes on to share pictures with his followers. We have visual proof now. Check the following tweets that he sent. 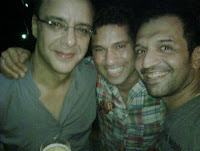 Hanging with vinod chopra and @atulkasbekar...3 more idiots ??? Then he tweets this "Vinod chopra has a script called 'ferrari ki sawaari'... Just heard it, sounds awesome.. "
Meanwhile news of his arrival is spreading and the next to announce was Shilpa Shetty. She tweets the following. "Finally on twitter, The God of cricket himself.A big welcome shout for SACHIN TENDULKAR himself @sachin_rt Spread the word"
Next up is Madhavan, he tweets this. "@sachin_rt welcome aboard chief....good to see you here"
There is still some amount of disbelief and people are not really sure if its the real Sachin there. Tweets start flowing everywhere. 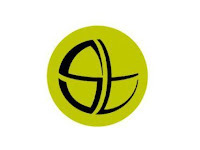 A twitter handle #GodisHere gains momentum and there is all round confusion. Funny man Fake Jhunjhunwala is woken up from his sleep and starts making some noise. He tweets the following to Atul Kasbekar for confirmation. "@atulkasbekar Atul,if this is a prank and Sachin is not here yet,then I will push for you to be given the death sentence." "I will put out a Supari and a Fatwa on Atul Kasbekar if he's lying & it turns out @sachin_rt isn't the real 1 @atulkasbekar #GODISHERE "
Atul is a little annoyed, he tweets this to Jhunjhunwala. "@jhunjhunwala oh ho check his timeline bro, stop getting ur knickers in a twist"
Junjunwala replies, "@atulkasbekar But Atul,I wear underwear.Not Knicker.100% cotton." Anyways, he seems to be convinced now and tweets this. "Credit where its due. @atulkasbekar should get a Bharat Ratna for getting @sachin_rt on twitter #Godishere"
"wonder why many people asking me if @sachin_rt is original.my friend atul kasbekar says so, so must be true"
But he again develops cold feet and tweets this. "btw,am not confirming any sachin id.just saw a friend announcing it,that's all"
Meanwhile Sachin shares few more photos and his UNEP logo on twitter which also becomes his profile pic. He tweets this. "That's my unep logo, as part of my initiative as global ambassador for the UN Environmental project"
Then goes on to tweet and share few more photos. 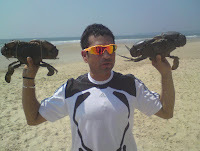 "Wonderful 2 b holdin crabs 4 change n not eatin them.4 the record my wife is scorpio n not cancerian"
Sachin is already displaying a sense of humor and is quite a welcome change to see him in a relaxed mood.Quite a contrast from the calm and demure image we see of him on tv. Inside God there is a little kid residing. He further tweets this photo. "With my childhood buddy Atul Ranade"
Impressive to see that even at this moment when he is announcing himself to the world of twitter, he doesn't hesitate to introduce his close buddy from childhood. Values intact. And yes, they seem to be in a playful mood. The world sighs a relief and now its almost certain that it is the man himself. He tweets again. "Can't believe the response I got in such a short time.Had a wonderful dinner with my close friends tonight.The evening was superb.Goodnight"
And as the final nail in the coffin, to confirm his existence on twitter he shares this snap of him sleeping, wonder how he did it after falling asleep though? "By the way this time its real me. No more wrong info... Good night..... "
After this, no one is in doubt that it is indeed the man himself. It becomes a waking timepass to look at this profile page and see the number of followers growing by the second. Its almost as if India is scoring all those runs. No one wants to sleep. They keep looking as if he is going to reach one million followers in one hour, something which we have always got used to from him, big numbers. Reluctantly we go to sleep and many many more celebs join in wishing him for joining twitter. Most are determined and hopeful to see that he is the highest followed person on Twitter. Some ask for his account to be verified but one wise man Ramesh Srivats tweets this. 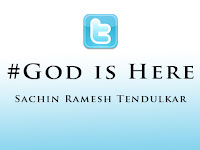 "I see that God has stepped into Twitter - @sachin_rt. Forget Verified Account. Twitter should classify it as a Venerated Account." We all agree. It sure is a venerated account. Only if Mahatma Gandhi were alive today and were to join twitter would there be such excitement. 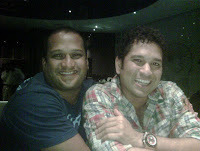 Here is wishing Sachin good luck on twitter too, by the first looks, he already has the makings of a winner here. We will be #TAILing him for sure.